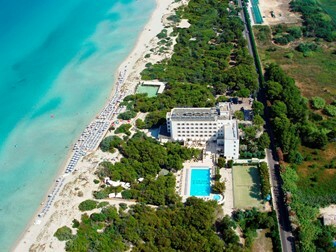 I have the pleasure to announce that the fourth edition of the Salento International Chess Open of 2015 will again take place from 23-30 May 2015 at the Ecoresort Le Sirene ****. Resort and renowned flagship Caroli Hotels Group, located in Gallipoli in the province of Lecce, in one of the most beautiful bays of Salento (Puglia) with stunning views of the bay of Torre del Pizzo, this beautiful hotel is located within a lush green oasis and offers rooms with all the amenities, a private beach, swimming pool, solarium, tennis and football, and is connected to the center of Gallipoli (7 km) thanks to a regular bus service. For the year 2015 Caroli Hotels Group offers the stay during the event with a convention in FULL BOARD € 60,00 per person in a double room and € 70.00, per person, in a single room, to this is added the ‘SPECIAL OFFER a FREE STAY, always full board, for 1 person for a group of four players who choose to share two double rooms. During the week will be organized trips to the beautiful and historic city of Gallipoli (5 km away), Otranto (about 30 km) Santa Maria di Leuca (about 45 km) and Lecce (about 45 km), various sports such as football and tennis, open chess lessons, run by GM and IM, along with the new features of the 2015, the tournament flash of welcome, the epic challenge in outdoor giant chess called “the battle of the sexes” and an evening dedicated to Texas Hold’em! Chess Projects, as chess organizer, for its part has welcomed the several certificates satisfaction received from players and escorts from Italy and from many foreign countries that participated in 2012, 2013 and 2014 editions with rich many initiatives designed and made in order to make the experience unique chess, guarantees a prize pool for this edition with expense claims for the value of € 5,000, divided into Open A: € 4,000 and Open B: € 1,000, and special prizes for the rating categories present in the two tournaments. Multiple initiatives have been implemented in this edition in 2015 in order to promote the presence of the Italian players despite the difficult economic situation that is hitting our country, therefore in addition to the lowering of the convention hotel and the realization of the formula tourist “group of 4, free stay for 1” and to maintain substantially unchanged fees guarantee a discount of 50% of the registration fee to every Italian player who will bring with it an Italian player who participates for the first time in the tournament. A further effort was made to further improving the number and the excellent technical level of INVITED edition 2015; and once again we must thank Caroli Hotels Group not only for the great hospitality guaranteed at the event but for the economic effort materialized in the sponsorship of this event has become an indispensable chess calendar appointment chess Italian and Apulian ..
More players present at the event will be announced in the coming months. Anti Cheating: with reference to specific legislation introduced recently by FIDE tournament organization has decided that it will not be permitted to be taken in the playing hall any electronic device, except that this is not positioned visible or not held on the player actively engaged at chess. The reception of Ecoresort Le Sirene Hotel is on hand to take into custody any electronic devices of the players not residing at the hotel. Those who use this service will have to fill in a paper to be delivered together with the electronic device and show their identity card at the time of his retirement. Hoping to have you with us in May 2015 for the 4th International Open of Salento and thank you in advance for your support to the success of the event.